When you come on a tour with us, there will be camels in the desert or mules in the mountains to carry your things. However, it’s good to try and pack as lightly as possible, as we have to save room for the essentials like water and food. Aside from your luggage, you must purchase travel insurance to cover your trek. In the unlikely event that you are sick, we want to be able to get you the best care possible. We require a photocopy of your travel insurance before the trip begins. Our set walking tours are designed to be accessible for anyone of any age who is reasonably fit and healthy. The aim is not to go as far as possible but to soak up the environment. A good nights sleep and good food are an essential ingredient of any trip therefore your tent comes provided with a mattress, sheets and blankets and our cuisine is second to none. A Communal tent is carried for each trip and you sleep in modern lightweight zip up tents. All the programmes you see here are merely guidelines. When you take a tour with Brahim, he will talk with you and help design one that suits your wishes and timeframe. No matter what you decide, spending at least one night in the desert is essential. One of the great pleasures of the desert is simply to lie back and watch the night sky. The desert sky at night is so beautiful that words cannot do it justice. The sky is full of stars shining, it seems, just for for you. The infinite beauty of the desert sky at night will be a memory you will cherish for many years to come.What could be more romantic than being treated as a Prince and Princess, sleeping on a bed fit for royalty, inside a luxury tent, climbing the highest dune in the evening to watch the sunset. Then, after a romantic candle lit dinner for two, star gazing, counting the shooting stars and making a wish on each of them. 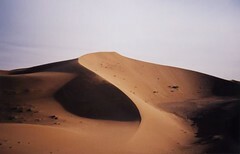 You may wish to spend four days travelling to Chigaga (the big dunes 65 km west of M’Hamid) where there is a Sacred Oasis. Taking a different route back to the bivouac will take six days. You may wish to spend from one to four days simply exploring the area around the bivouac on foot with a guide. You could search for fossiles, drink tea with Nomads or go bird watching. This is a relaxed programme, where you set the pace walking in the early morning or late afternoon, spending the midday in the shade of the bivouac.If you wish to spend a night with a real Nomad family, Brahim will help you realize your dream by taking you to a Nomad family. He will leave and collect you the following morning. This is a genuine Nomad family you will see how they live and experience life with them.With a day’s notice a very special meal can be arranged for you. Mechoui involves killing a sheep and cooking it in a desert oven made of mud. This is a unique Moroccan dish.Before leaving Zagora, the woman can have her hands covered in a beautiful henne design.